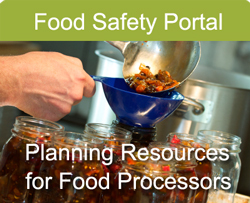 Welcome to the Food Safety Portal, web pages designed to provide easy access to multiple resources to help you build and maintain a food safety management plan. We hope you find these web pages informative and helpful in developing a formal food safety plan for your business. Building a food safety system can be a daunting task. Access background information about regulations and standards, tools to develop a food safety plan, a database of legislation and regulations and other resources, including a library of sample documents. Register for online and onsite educational opportunities for food processors, from basic education about HACCP and other food safety management systems, to specific topics like recall and traceability. Already registered in courses? Click below for easy access!